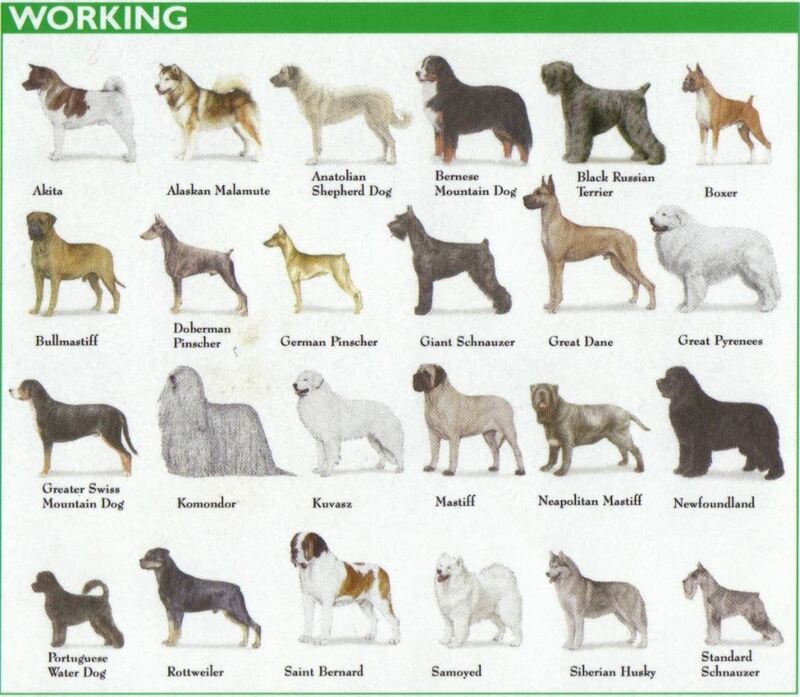 The Akita (Japan), the Komondor (Hungary), the Portuguese water dog, the Newfoundland, the Saint Bernard (Switzerland), the Alaskan Malamute, the Bernese Mountain dog (Switzerland) and many more make this group a veritable United Nations of dogs. A diverse group skilled in a number of disciplines, most working breeds are robust, intelligent and headstrong, often unsuitable for novice owners. Made up of guardians of livestock and property, police dogs, sled dogs and rescue dogs, these workers come in all shapes and sizes, from the standard schnauzer to the Great Dane. But for the most part, these are large, powerful dogs. Without the right training, some working dogs can be difficult to handle, even dangerous. Put in other terms, dogs of the Working Group were bred to perform such jobs as guarding property, pulling sleds and performing water rescues. They have been invaluable assets to man throughout the ages. The Doberman Pinscher, Siberian Husky and Great Dane are included in this Group, to name just a few. Quick to learn, these intelligent, capable animals make solid companions. Their considerable dimensions and strength alone, however, make many working dogs unsuitable as pets for average families. And again, by virtue of their size alone, these dogs must be properly trained.